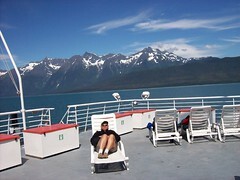 We've had three great days in Juneau after riding down to Skagway from Whitehorse and taking the ferry to Juneau. The first day was stunningly sunny and blue, but now we're getting the real Juneau - cloudy and drizzly. Throughout the Dempster and the Yukon every campground and pullout and rest stop has had the same type of bear-proof garbage container. As a touring cyclist, you should know that you can open the back of these up and just put your food in them for a night - it's much easier than hanging it from a tree. 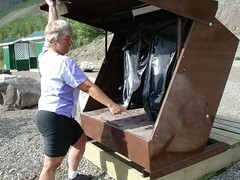 This picture shows Nancy opening the back of the container. Note that the garbage is nicely separated from your foot by the trash bags. From Dawson to Whitehorse to Skagway we've been in the heart of the Klondike Gold Rush country, hearing and breathing the story of the great stampede of 1898. 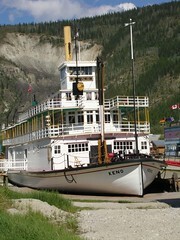 What's amazing to me is that sternwheeler steamboats plied the Yukon until 1956! That's after I was born. 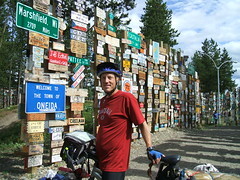 It was really the only way to get to Dawson until the highway was built in 1953. Dawson is an isolated place. And the next step of amazing is that the steamboats served the entire Yukon: 2000 miles from Whitehorse to the Bering Sea. Every time we pass the Yukon or a tributary (like the Eagle, which we crossed on the Dempster) I want to get in a canoe and float to the sea. It would take a long time! In Dawson, just downstream of the campground, there's an overgrown path to the old graveyard for the many, many steamboats that died on this river. This picture is taken near midnight, just for perspective - maybe after midnight. 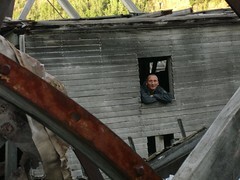 This is our friend Oliver in the cabin of one of the old steamers. 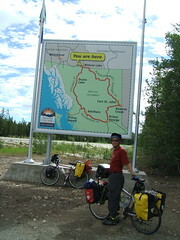 Our friend Rob Ungless flew in from Vancouver to join us for the Skagway-Juneau-Haines Alaska loop. We met Rob two years ago in the San Juan Islands (on a cycling trip) and we've kept in touch - he took us up on our offer to all of you to join us for any part of the trip. You're all welcome! You can ask Rob whether it's safe or not. 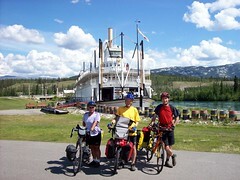 Here we are in front of a Whitehorse landmark, the Klondike steamer. It's much larger than the one we saw in Dawson, and it ran the river from here to Dawson.